The highway between Kansas City and Lawrence is a half hour drive, clears my head, scares me. Tonight I drove it with the top down and the stars out, through a few of the hours of Kansas summer when the cool comes. I have been almost killed on that highway twice. I have written a novel about someone being almost killed on that highway. She’s okay. She’s not real. The driving, though, which I don’t do so much, anymore, so much space, so meditative, I am awed by being between places, unreachable, as much as if on a long hike, and having the small hills, easy curves, crops, unplanted fields, in day, and at night, more stars than I almost ever see and a half moon and an arc of three stars below it. I hate the drive. I know although we pretend, driving is the most dangerous thing we do. I’ve gotten the phone call about the accident. I love the drive, ever since I could drive, that drive has been a drive back to something, the drive to Lawrence. I’d go dancing, drinking, hiking, writing. In New York, I’m a connoisseur of adventure and loneliness. Last night in Kansas City I stayed up all night talking with friends. I am thinking much of the business of turning 40, which I can see ahead: giving up exactly what you wanted. Not the husband, brownstone, four kids, published novels, in New York. Something else. Parts of that, different ways, inside out or backwards, maybe, but not exactly that. I had a dream last night of flying around the city, seeing everything happening on different floors of buildings, Rockefeller Center, the rivers, the Empire State Building, the cars, the trains, the ferry boats, the bridges, it was beautiful, I flew. I’ve now done 85% of my thirties with a lot of doors hanging open, and it’s been enticing and exhausting. Maybe, maybe, I am becoming more at peace with what is open, and how to consider the doors, the ones that won’t open, the ones that yawn. Driving home and the highway is also under construction, and there was an accident, but mostly there were lots of stars and lots of indigo cotton darkness and other people driving carefully home, too. 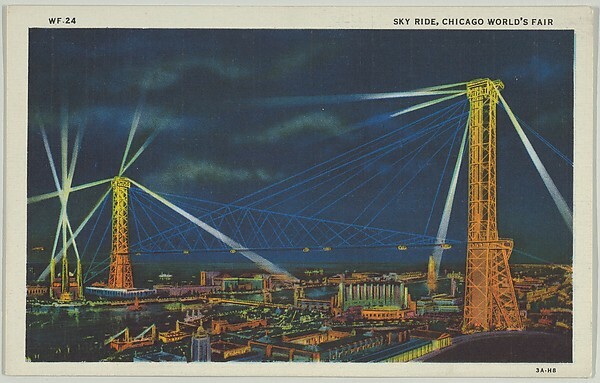 Image: Max Rigot Selling Co., Chicago, Sky Ride by Night, from the Chicago World’s Fair series, Metropolitan Museum of Art. I have made that drive so many more times than you, on good days and others. I was never in danger on the Eudora flats, but removed things from the twisted wreck of one of your Hondas. My first ragtop to Lawrence was the MG Midget, so much less reliable than my current ride you borrowed. The perspective of those born in the 1940’s is a magnified view of closing doors and things, great and small, being lost by dear friends and yourself.